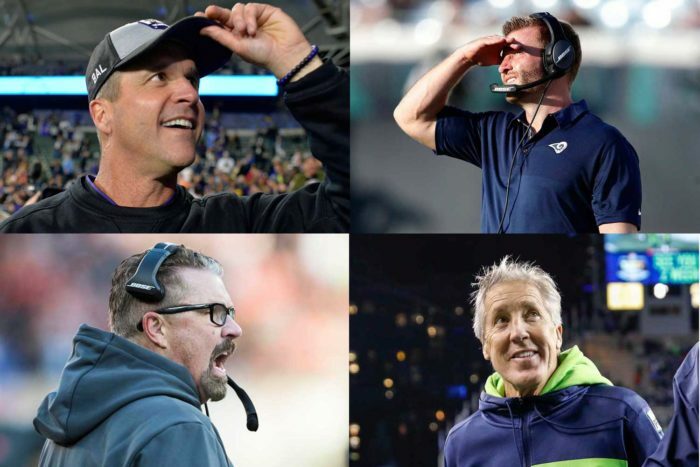 Christmas came a little early for two deserving NFL head coaches. First, Baltimore Ravens head coach John Harbaugh learned from ownership that any rumors of his possible termination at the end of this season are completely unfounded – he’s not going anywhere. And the same can be said for Pete Carroll in Seattle, where the Seahawks gave him a contract extension through 2021. The Harbaugh news came two days after his Ravens turned the AFC playoff bracket upside down with a 22-10 win over the Chargers in Los Angeles. That game earned Harbaugh a Head Coach Ranking grade of 8.8 – tops for Week 16. Carroll, whose Seahawks clinched a playoff spot with a 38-31 win over the Kansas City Chiefs, was tied for the second-best grade of the week at 8.2. Overall, the Saints Sean Payton remains No. 1 in Head Coach Ranking with a grade of 8.0. The chiefs’ Andy Reid is second at 7.9, while Harbaugh moved into a tie for third with Sean McVay at 7.8. The San Francisco 49ers lost at home to the Chicago Bears, but Kyle Shanahan outscored the Bears’ Matt Nagy, 7.0 to 6.8. The Patriots defeated the Buffalo Bills, 24-12, but Buffalo’s Sean McDermott earned an HCR grade of 7.4 compared to 7.2 for New England’s Bill Belichick. Payton and his Saints clinched home-field advantage in the NFC playoffs with a win over the Pittsburgh Steelers, but Pittsburgh’s Mike Tomlin outscored him in Sunday’s game, 7.4 to 7.2.